ASUU to Embark On A Nationwide Warning Strike Next Week. Indication has emerged that the Academic Staff Union of Universities (ASUU) may embark on a warning strike soon if their demands remain unmet by the Federal Government. 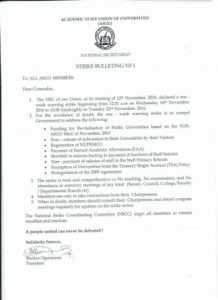 According to a notice signed by the Biodun Ogunyemi, the president of the union, the one week warning strike will commence on November 22nd, 2016. The notice further stated that the warning strike will be comprehensive. That means that there will be no teaching, no exam and no statutory meeting of any kind.08164708053.